During his final State of the Union address on Tuesday night, President Obama took a somewhat unusual step for a member of the Democratic Party. At the same time, he delivered an important call to action for Congress on an issue that has come to define much of his time as president. Obama called for use of military force against ISIS, the extremist Islamic terrorist group also known as ISIL and the Islamic State. If this Congress is serious about winning this war, and wants to send a message to our troops and the world, you should finally authorize the use of military force against ISIL. Take a vote. The Democratic Party isn't known for its leadership on military issues. In fact, it's perhaps more often known for its calls to cut military spending and reduce the use of troops overseas. Yet Obama has been wrestling with how to handle the seemingly increasing threat from groups like ISIS for months — if not years. All the while, public support for military use in the fight against the Islamic State has increased, giving him a good reason to go against the line that his party usually supports and to call on Congress to authorize the use of military force in the Middle East. Obama started his discussion of ISIS by declaring, "Priority number one is protecting the American people and going after terrorist networks." He went over his administration's current approach to such groups, namely ISIS, by describing the rhetoric he wants us to avoid and the multi-national coalition that the country is leading. But as we focus on destroying ISIL, over-the-top claims that this is World War III just play into their hands. ... For more than a year, America has led a coalition of more than 60 countries to cut off ISIL's financing, disrupt their plots, stop the flow of terrorist fighters, and stamp out their vicious ideology. With nearly 10,000 air strikes, we are taking out their leadership, their oil, their training camps, and their weapons. We are training, arming, and supporting forces who are steadily reclaiming territory in Iraq and Syria. 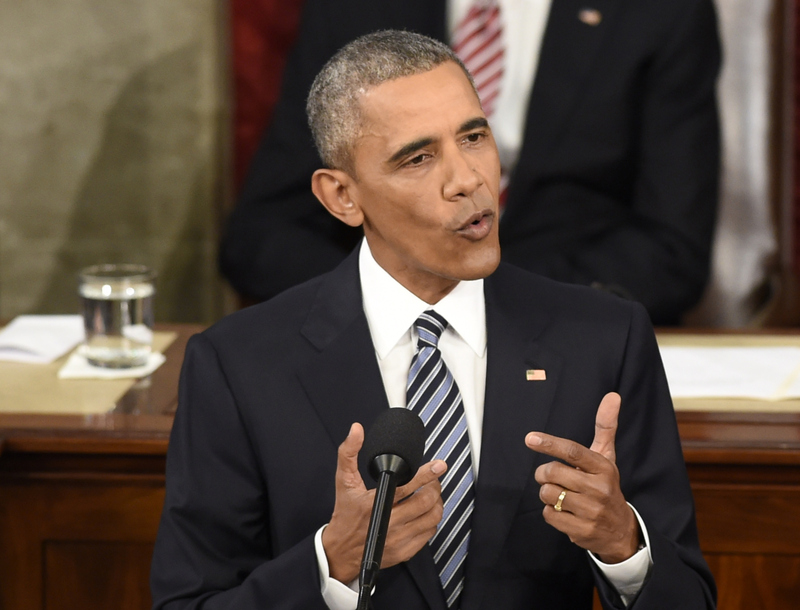 It's at that point that Obama called on Congress to use its authorization power to do more. (Given the Republican majorities in both houses, you wouldn't expect such authorization to be difficult.) Ultimately, Obama's point about doing more to stop ISIS and the need for Congress to step in to make that happen drives home what Americans seem to be thinking more and more: that the current approach to national security as it pertains to ISIS may not be enough. As a major part of what is likely to be his last primetime address to the nation, the national security point definitely did not go unnoticed in Obama's State of the Union address.